Friday night, a stompin', feel-good evening at the Groveland Hotel for an audience younger than I am but still largely of mature years. I sang along to Eagles' tunes on the radio long before I ever found out who they were. In fact, when I heard the first collection of their songs, I went "Wow! I love these guys. Who knew?" I love them so much that I gathered up Sister-In-Law for the Eagles' 2005 visit to Arco Arena in Sacramento. Two-thousand-five? That long ago? I got a mad crush on Don Henley, so un-rocker-looking now, with the voice of an angel. I'd follow him anywhere. I love them so much that I use the DVD of their 2005 Eagles Farewell I Tour for dance exercise, should the inclination to exercise strike me unexpectedly. Nothin' like movin' to the music! So, of course, when I drove by the Groveland Hotel a few weeks ago and saw the sign for an Eagles Tribute Band concert, I said to myself, self, gotta go. SIL didn't think she could go, and Sister and Brother-In-Law were on a trip elsewhere, so I bought a ticket for me, just me. Anticipating a bit of a parking problem around the hotel -- it's across a small street from the Iron Door Saloon, California's oldest continuously operating drinking establishment, which has its own Friday night crowd -- I went a little early, as in first or second to be seated while the band was still setting up their equipment, still not in their performance duds. hotel patio below, five minutes before starting time. Four minutes past starting time. They're all fidgeting on stage. and introduce them, or are they on their own? 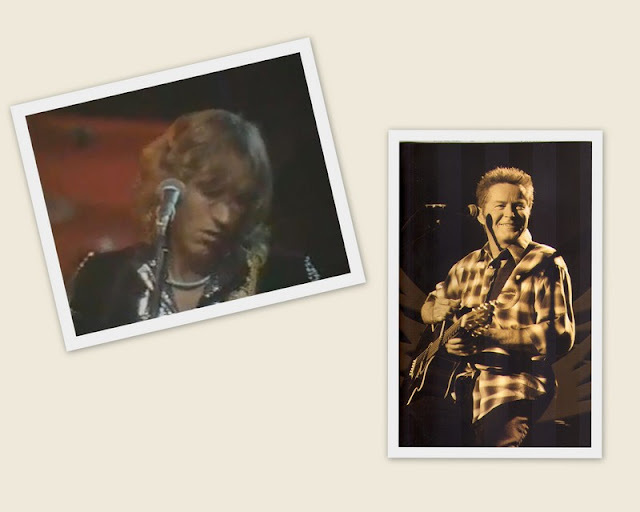 I'll have to do it here: It's "Life in the Fast Lane -- The Songs of the Eagles Musical Journey," info gleaned partially from the band and partially from a website. Finally, Lonnie steps up and just starts, with Take It Easy. One woman beckons to me to dance. My feet are tapping, my fingers are snapping or plucking at an air guitar. I want to move, I want to get up and dance, but I'm afraid. I'm afraid of my poor balance. I'm afraid of my legs . . . I can get so into dancing that I over-tax the leg muscles and crumple to the ground. Not that I think it would hurt so bad, but picking an old lady up off the pavement would become the center of the show. So, regretfully, I decline. I watch instead. they were going to get some sleep? I loved to dance with my husband, gone now for 12½ years. He started the courtship with dancing on our first date and it continued on. I loved to dance with him to Hotel California, slow-dance style. I loved how dancing played out in sexual tension, a slow seduction, anticipation. Only him. I hated changing partners when dancing at a group event, hated being held by other men, sweaty men, whose dampness I had no desire to share. The crowd is up and dancing and begging for more. I'm with them in my head and my core. A guy is up shooting pictures of his wife out there on the dance floor . . . So they start up Hotel California again for the finale. Memories come back of our stop, in the middle of the night, at a place called Little Lake, about 50 miles south of Lone Pine, California, a place that shone eerily out of the darkness at the side of the long lonely highway, a checkpoint for the 365 motorcyclists riding the 1978 3 Flags Classic, from Tijuana to Vancouver over Labor Day Weekend. It was strange and disorienting trying to get on and off the highway, to do the check in, to find the toilets. 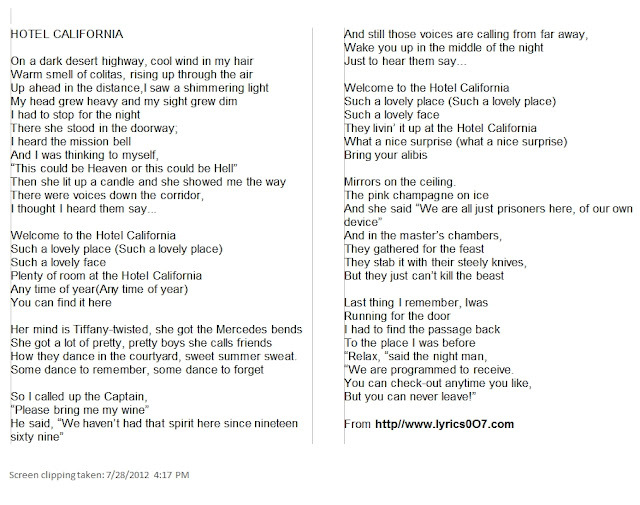 My mental image of Hotel California is much like that place, vague and illusionary. As the song rolls on, tears begin to roll down my cheeks. The crowd is shouting out for more. Some are standing at the back of the patio, others, like me, sit, limp, in our chairs. Then I realize what's happening and I start to clap and shout too. The crowd to the back is yelling for their favorite, but the band's choice for the encore is Heartache Tonight. It's empty between the two rows of seats perpendicular to me down the left side of the patio. I abandon my purse and my camera on my chair and stand up and dance in that aisle. At least if my legs collapse, I'll fall in a chair. 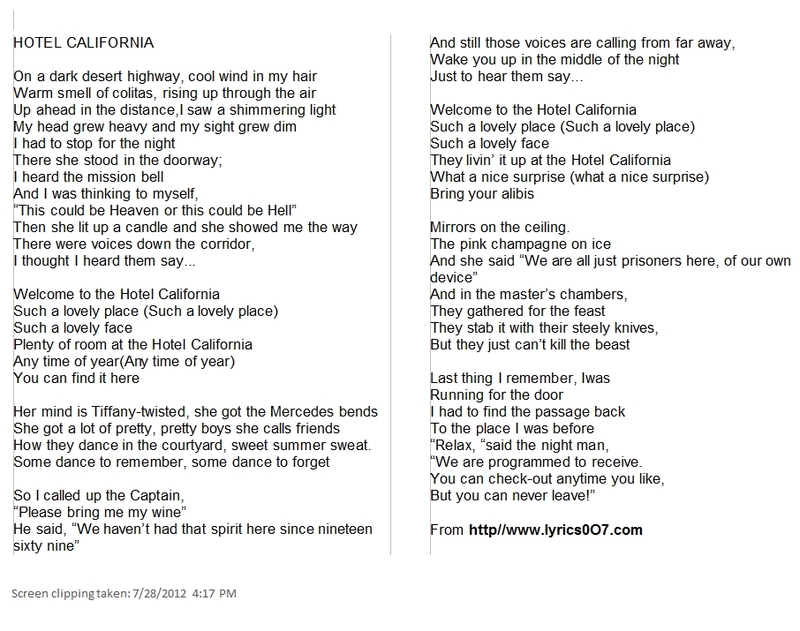 Hotel California is the group's usual finale, according to the website, as the show is set in that mythical place. But I think the setting of the Groveland Hotel patio and the fanciful parallels that were made prompted them to play it at an earlier time in the playlist. The Eagles themselves play their pieces exactly the same every time. They feel their fans come to see and hear the familiar and they want the fans to get the familiar, so that pretty much sets a template for a tribute band if it wants to come off sounding like the real thing. Fast Lane was pretty much true to form. There were a couple of pieces where they did the lead-ins with different chording and I couldn't tell whether they'd done a different arrangement or were out of sync. There was some fabulous guitar work. Vocals were very good, although no one can match that high-pitched clarity of Don Henley, in my humble opinion. The proprietor of the hotel asked the audience at the end of the performance for suggestions for next year's series of patio concerts and I think it showed its enthusiasm for a repeat from Life in the Fast Lane. When you hear the sound of fire bombers . . . The Slightly Deflected Holiday . . .